Overview. The Governor’s budget provides a total of $21.1 billion from various fund sources—the General Fund, state special funds, bond funds, federal funds, and reimbursements—for various transportation departments and programs under the new Transportation Agency in 2013–14. This is an increase of $558 million, or 2.7 percent, above estimated expenditures for the current year. The proposed budget includes $12.8 billion for the California Department of Transportation (Caltrans), $3.2 billion for the California High–Speed Rail Authority (HSRA), $2 billion for the California Highway Patrol (CHP), $998 million for the Department of Motor Vehicles (DMV), and $872 million for transit assistance. Caltrans. The Governor’s budget includes a net increase of $9 million and 19 positions for Caltrans to develop project initiation documents (PIDs) in 2013–14. However, we find that the budget understates the likely efficiencies from implementing a more streamlined process for PIDs and recommend adjusting the program’s budget accordingly. In addition, Caltrans reports that it has fallen behind on its PID work in the current year and must catch up in 2013–14, which raises questions about the department’s ability to manage its existing resources and complete workload within established schedules and budgets. The budget also proposes to consolidate four existing programs at Caltrans into a new program focused on active transportation, such as biking or walking. We find that the proposed consolidation is a step in the right direction, but recommend a few modifications to improve the likelihood that the program will achieve its goals. In this report, we also discuss how the proposed budget for Caltrans does not fully account for prior–year Proposition 1B appropriations that will be available to support projects in 2013–14. HSRA. The Governor’s budget requests $10 million to increase staff by 20 positions and to fund several external services contracts. We recommend the Legislature approve the additional positions. However, we recommend the Legislature reject the proposed budget bill language that would allow the HSRA to administratively establish an unspecified number of additional permanent positions. In addition, we recommend reducing the funding for the financial services consultants by $1.3 million because some of the identified tasks would be more appropriate for, and less costly if performed by, existing state staff. CHP. The budget requests funding for advanced planning to replace five CHP area offices. However, the budget does not identify which specific area offices will be replaced and why those facilities are most in need of replacement. The absence of such key information makes it impossible for the Legislature to ensure that the highest–priority projects and the most cost–effective method for delivering them are being proposed. The new Transportation Agency will have jurisdiction over the state’s transportation departments and programs. (As part of a larger reorganization plan adopted as part of the 2012–13 budget package, the transportation responsibilities of the existing Business, Transportation, and Housing Agency will become part of the Transportation Agency as of July 1, 2013.) These departments and programs include Caltrans, HSRA, CHP, DMV, and the State Transit Assistance (STA) program. The Governor’s budget proposes a total of $21.1 billion in expenditures from various fund sources—the General Fund, state special funds, bond funds, federal funds, and reimbursements—for all departments and programs under the Transportation Agency in 2013–14. This is an increase of $558 million, or 2.7 percent, above estimated expenditures for the current year. Figure 1 shows spending for the state’s major transportation programs and departments from all sources. Caltrans. The Governor’s budget proposes total expenditures of $12.8 billion in 2013–14 for Caltrans—$474 million, or 3.6 percent, less than estimated current–year expenditures. As Figure 1 shows, Caltrans expenditures from bond funds are projected to significantly decline—by almost $1.5 billion (or 39 percent)—while expenditures from all other fund sources are projected to increase or remain flat. The lower bond fund expenditures reflect assumptions that bond spending will substantially decline in 2013–14 as projects are completed in the current year. HSRA. The Governor’s budget proposes total expenditures of $3.2 billion in 2013–14 for HSRA. This amount is about $800 million, or 33 percent, more than the estimated level of expenditures for the current year. The proposed level of expenditures would be supported from the proceeds of bonds authorized by Proposition 1A (2008) and matching federal funds. Transit Assistance. The Governor’s budget estimates total expenditures of $872 million in 2013–14 for the STA program, which is $142 million, or 14 percent, less than estimated current–year expenditures. Reduced spending from bond funds in 2013–14 reflects assumptions that transit capital projects will be completed in the current year. In this section, we discuss the sources and uses of funding for transportation infrastructure programs in California and review recent changes to the state’s transportation funding structure. California’s transportation programs provide for the operation, maintenance, and improvement of the state highway system, three inter–city passenger rail services, and other state transportation systems. The state also provides funding for local roads and mass transportation. In addition to state funds, California’s transportation systems receive substantial amounts of funding from the federal government and local governments. We estimate that, in 2013–14, approximately $27 billion in transportation revenues will be provided from all levels of government. 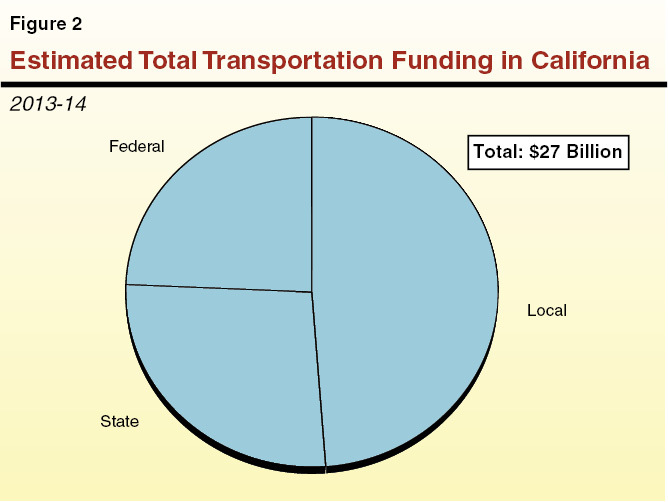 As indicated in Figure 2, local governments provide almost half of all transportation funding in California. Local transportation funding sources are varied and include local sales taxes, transit fares, development impact fees, and property taxes. The state expects to receive almost one–fourth of its transportation funding from the federal government—mainly through the surface transportation program, “Moving Ahead for Progress in the 21st Century Act” or MAP–21. Caltrans administers most of the ongoing federal funds for state highways and local roads. Federal grants also support some of the costs to construct the high–speed rail line in the Central Valley. In addition, federal grants are provided directly to local transit agencies. As we discuss below, the remaining one–fourth of California’s transportation funding comes from a variety of state revenue sources. As shown in Figure 3, total state transportation revenues have roughly doubled over the past 15 years—from $3.5 billion in 1999–00 to an estimated $7.2 billion in 2013–14. This revenue comes from three main sources: (1) excise taxes on gasoline, (2) vehicle weight fees, and (3) sales and excise taxes on diesel fuel. Gasoline Excise Taxes. 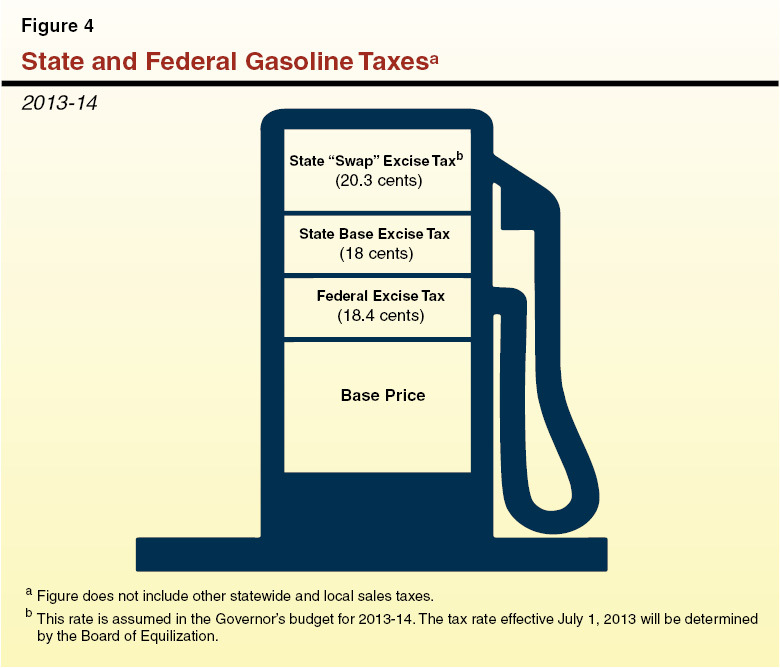 As shown in Figure 4, the state collects two excise taxes on gasoline. First, the state collects a base excise tax of 18 cents per gallon of gasoline. Since 2010–11, the state also collects a variable gasoline excise tax, which is sometimes referred to as the “swap” excise tax. This particular tax is adjusted annually by the Board of Equalization in accordance with the provisions of the “fuel tax swap” that was adopted by the Legislature in 2010. (Please see the nearby box for a more detailed description of the fuel tax swap.) The Governor’s budget estimates that this variable gasoline excise tax will be 20.3 cents per gallon in 2013–14. As indicated in the figure, a federal excise tax of 18.4 cents per gallon is also collected to support federal transportation funding. What Is the Fuel Tax Swap? Swap Eliminated Sales Tax on Gasoline, Increased Excise Tax. Prior to 2010–11, the state charged a sales tax on gasoline, which was dedicated to certain transportation programs. In March 2010, the Legislature enacted Chapter 1, Statutes of 2010 (ABX8 6, Committee on Budget), and Chapter 12, Statutes of 2010 (ABX8 9, Committee on Budget), which, along with subsequent legislation, is commonly known as the “fuel tax swap.” Under this swap, the Legislature exempted gasoline from the state sales tax and imposed an additional, revenue neutral excise tax on gasoline. (The rate of the new excise tax is adjusted annually by the Board of Equalization to ensure that the amount of revenues collected equals the loss of the sales tax on gasoline.) At the time that the fuel tax swap was enacted, these additional excise tax revenues had been intended to pay transportation debt service and maximize the benefit to the state General Fund. Use of Weight Fees. After the passage of the fuel tax swap, Proposition 22 was approved by voters in 2010. Among other things, this measure prohibited the use of excise tax revenue to provide General Fund relief. In order to preserve the intended benefit of the fuel tax swap to the General Fund, the Legislature modified the swap to use vehicle weight fees—instead of the new excise tax on gasoline—to help the General Fund. (Weight fees are charged to register certain trucks and are based on truck size and weight.) Prior to the swap, weight fees had been used to fund other state transportation programs out of the State Highway Account. In order to maintain funding for these programs, a portion of the swap excise tax is used to backfill the lost weight fee revenue. Diesel Fuel Taxes Adjusted to Increase Transit Funding. Eliminating the sales tax on gasoline reduced the amount of funding available for mass transportation. Therefore, the Legislature increased the sales tax rate on diesel fuel to provide additional funding for mass transportation. Since the fuel tax swap was intended to be revenue neutral, the excise tax on diesel fuel was reduced by a proportional amount to fully offset the increased sales tax rate. 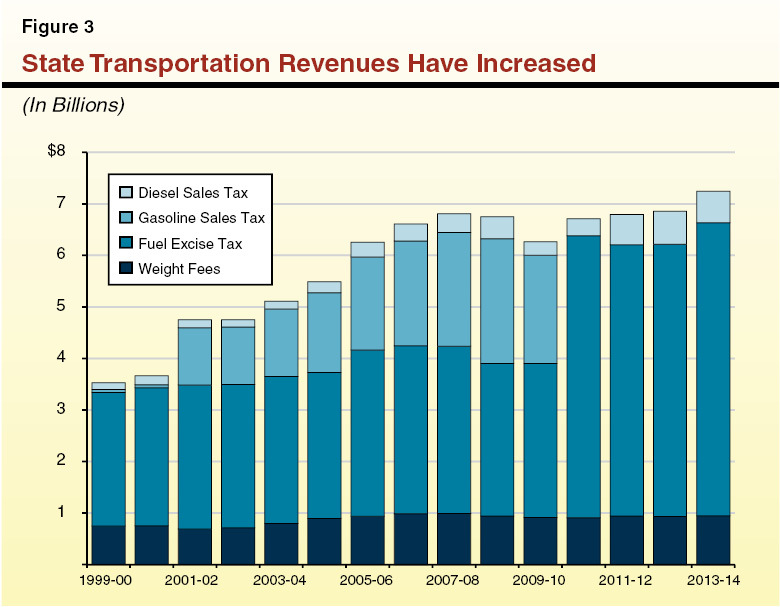 For 2013–14, the base excise tax on gasoline is estimated to generate $2.6 billion. Two–thirds of the revenue from this tax is deposited into the SHA and one–third is allocated for local streets and roads. The SHA provides funding for Caltrans administration and the state’s various transportation programs. The largest of these programs is the State Highway Operation and Protection Program (SHOPP), which funds capital projects to improve the state highway system, such as pavement rehabilitation and safety improvements. Other major programs funded from the SHA include highway maintenance, state highway operations, and the State Transportation Improvement Program (STIP), which funds new highway construction projects that add capacity to the highway system. For 2013–14, the swap excise tax on gasoline is expected to generate approximately $3 billion. About $946 million of this revenue is deposited in the SHA to backfill the loss of weight fee revenue as discussed below. Of the remaining $2.1 billion in swap excise tax revenue, 44 percent is allocated for local streets and roads, 44 percent provides funding for STIP, and 12 percent provides additional funding for SHOPP. Weight Fees Used to Repay Transportation Debt. Since 1990, California voters have passed five propositions authorizing the state to sell a total of $34.9 billion in general obligation bonds for various transportation–related purposes. As of January 1, 2013, about $15.1 billion of these bonds have been sold, leaving $19.8 billion available to be sold for future projects. The Governor’s budget estimates that the debt–service cost on transportation bonds will be about $1.1 billion in 2013–14. To the extent possible, transportation funds are used to pay transportation debt–service costs. However, various statutory and constitutional restrictions prevent most transportation tax revenue from being used for this purpose. Weight fees are a source of revenue that is allowed to be used to repay these bonds. For 2013–14, the Governor’s budget uses all $946 million in weight fees to benefit the General Fund. Of this amount, $907 million is used to pay debt service and $39 million is loaned to the General Fund and set aside for future debt service. Taxes on Diesel Fuel. The state charges a sales tax on diesel fuel for transportation purposes at a base rate of 4.75 percent. As part of the fuel tax swap, the state collects an additional sales tax on diesel fuel to provide funding for mass transportation, also referred to as the state swap sales tax on diesel fuel. The rate of this additional sales tax varies according to a schedule specified in statute. In 2013–14, this rate will be 1.94 percent. As shown in Figure 5, the sales taxes apply to the retail cost of diesel fuel, which includes the state excise tax (estimated in the Governor’s budget to be 9.8 cents per gallon in 2013–14) and a federal excise tax of 24.4 cents per gallon. 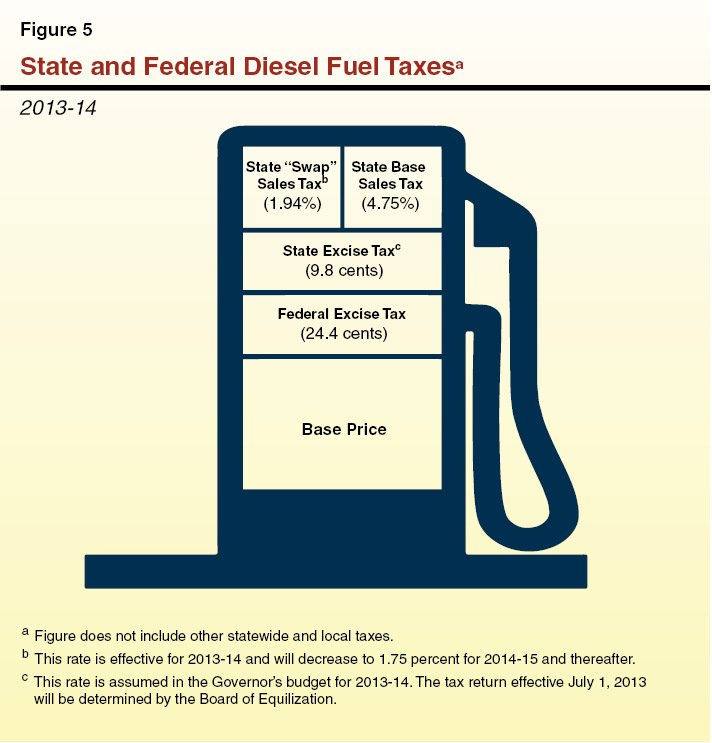 For 2013–14, sales taxes on diesel fuel are estimated to generate a total of $611 million. Of this amount, $440 million is expected to be generated from the 4.75 percent base sales tax. Half of this revenue is allocated to the STA, which distributes funding to transit operators and local governments for mass transportation. The other half of the base sales tax revenue is used to fund state–supported intercity rail and other state mass transportation programs. All of the revenue from the 1.94 percent swap sales tax on diesel fuel—$171 million in 2013–14—is allocated to the STA. The diesel excise tax is expected to generate about $288 million in 2013–14. The first 6 cents, about 61 percent of the total in 2013–14, is allocated directly to local governments for local streets and roads and the rest is deposited in the SHA for various other state transportation programs. The Governor’s budget proposes total MVA expenditures of $2.9 billion in 2013–14. This is an increase of about $115 million, or 4 percent, from the estimated level of current–year expenditures. MVA Revenues. The MVA derives most of its revenues from vehicle registration fees, which account for $2.4 billion, or 83 percent, of the estimated $2.9 billion in MVA revenues in 2012–13. Other sources of MVA revenue include driver license and identification card fees, and a variety of other miscellaneous fees for special permits and certificates. MVA Expenditures. The MVA expenditures mainly support the activities of CHP (62 percent), DMV (31 percent), and the Air Resources Board (4 percent). Figure 6 shows the Governor’s proposed MVA expenditures for the three main departments it funds. In addition, roughly $280 million in MVA funds have been transferred to the General Fund to provide relief since 2009–10, and $480 million in loans of MVA funds have been made to the General Fund since 2010–11. The Governor proposes to repay $300 million of the $480 million in loans made from the MVA to the General Fund in 2015–16. General Fund Transfer ($66 Million). The Governor’s budget proposes the continuation of a transfer of roughly $66 million from the MVA to the General Fund, which reflects certain MVA revenues that are not constitutionally required to be used for transportation purposes. Replacement of CHP Offices ($25 Million). The budget proposes various projects to replace CHP offices that are seismically and programmatically deficient. For example, the budget includes $21.4 million to fund the construction phase of the Santa Fe Springs replacement area office and $1.5 million to fund advanced planning and site selection for up to five replacement offices. Construction of DMV Office in Grass Valley ($6.5 Million). The Governor’s budget requests $6.5 million in MVA funding for the construction phase of the replacement DMV field office in Grass Valley. The project will replace the current 1,998 square foot facility with a 7,583 square foot facility at a total estimated cost of $7.7 million. DMV Regulations for Autonomous Vehicles ($1 Million). The Governor’s budget requests nearly $1 million in 2013–14 for DMV to develop regulations for the safe operation of autonomous vehicles by January 1, 2015, as required by Chapter 570, Statutes of 2012 (SB 1298, Padilla). The proposed funding would support two limited–term positions and the costs to contract with a subject area expert. Caltrans is responsible for planning, coordinating, and implementing the development and operation of the state’s transportation system. These responsibilities are carried out in four programs. Three programs—Highway Transportation, Mass Transportation, and Aeronautics—concentrate on specific transportation modes. Transportation Planning seeks to improve the planning of all modes. The Governor’s budget proposes total expenditures of about $12.8 billion for Caltrans in 2013–14. This is $474 million, or 4 percent, less than the estimated current–year expenditures. The lower spending level is due to assumptions that Caltrans will spend a substantial amount of Proposition 1B bond funds in the current year and that spending on these projects will taper off in 2013–14 as projects are completed. 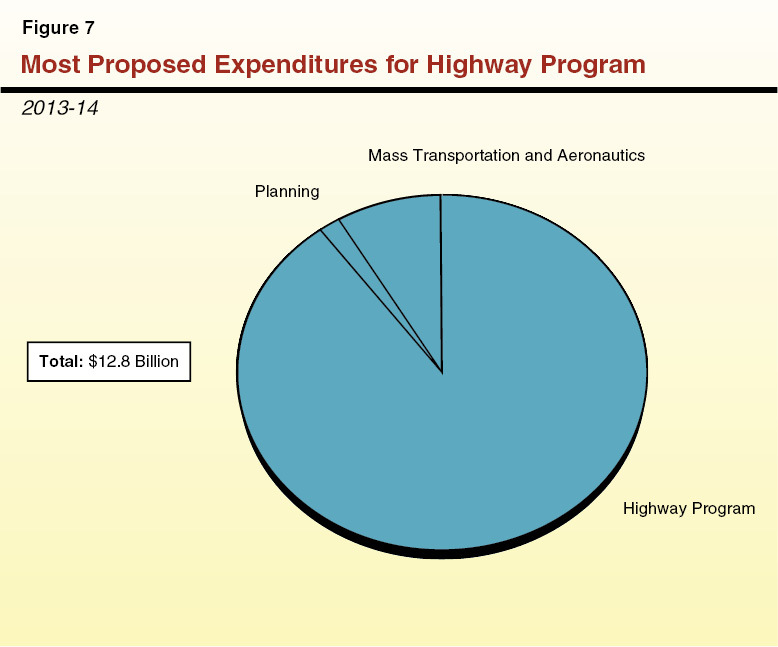 As shown in Figure 7, most of the proposed spending would support the department’s highway program. The level of spending proposed for 2013–14 would support about 20,000 personnel at the department and several thousand transportation improvement projects statewide. Background. In 2006, voters approved Proposition 1B (Highway Safety, Traffic Reduction, Air Quality, and Port Security Bond Act of 2006), which authorized the state to sell $20 billion in general obligation bonds for various transportation projects. As specified in the proposition, such projects include those intended to improve state highways and local roads, modernize and expand transit systems, improve rail and freight facilities, and mitigate transportation–related air pollution. Figure 8 details the purposes for which Proposition 1B bond funds can be used. 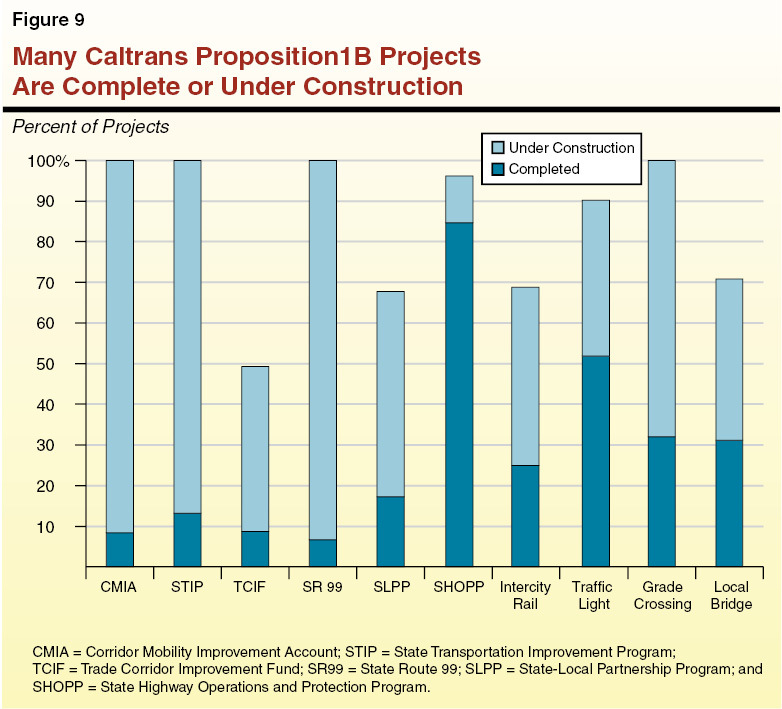 As shown in the figure, Caltrans—in conjunction with the California Transportation Commission (CTC)—is responsible for administering a majority of the Proposition 1B programs. Reduce congestion on state highways and major access routes. Purchase vehicles and right–of–way, and make capital improvements. Increase capacity of highways, roads, and transit. Improve movement of goods on highways and rail, and in ports. Enhance capacity, safety, and operations. Match locally funded transportation projects. Rehabilitate and improve operation of highways. Purchase vehicles for state system and make capital improvements. Improve safety and operation of local streets and roads. Seismically retrofit local bridges and overpasses. Reduce emissions from goods movement activities. Retrofit and replace polluting vehicles. Improve security and facilitate disaster response. Improve security in publicly owned ports, harbors, and ferry facilities. CTC = California Transportation Commission; CMIA = Corridor Mobility Improvement Account; STIP = State Transportation Improvement Program; TCIF = Trade Corridors Improvement Fund; SLPP = State–Local Partnership Program; SHOPP = State Highway Operation and Protection Program; and CalEMAs = California Emergency Management Agency. $74.1 million for the Trade Corridors Improvement program. $40.8 million to support projects on State Route 99. $30.5 million for intercity rail projects. $15 million to seismically retrofit local bridges and overpasses. For 2013–14, however, Caltrans appears to have changed its methodology for determining its requests for Proposition 1B appropriations. Specifically, the department has not accounted for the prior appropriations that it estimates will remain available for projects in 2013–14. Based on information provided to us by the department, it appears that Caltrans could have a total of $184 million from prior–year appropriations that could be used to support those projects for which the Governor’s budget is requesting new appropriations. By failing to account for these available funds, the department’s request overstates the amount of new appropriations needed in the budget year by $184 million. At the time of this analysis, Caltrans staff was unable to explain why the department did not take into account the availability of prior–year appropriations as it has done in the past when requesting new Proposition 1B appropriations. LAO Recommendation. Given that the department is requesting a greater level of appropriations than it needs for approved projects, we recommend that the Legislature require Caltrans to revise its request in the spring to account for prior appropriations that will remain available for projects in 2013–14. At that time, the department should have a more realistic estimate as to how much funding will be available from prior–year Proposition 1B appropriations to support planned construction in the budget year. Background. At various stages throughout the development of a highway capital project, Caltrans estimates the cost and scope of the work required to complete the project. One such estimate is completed during the preparation of the initial plan for the project, which is commonly referred to as a PID. Specifically, the PID contains various information about the proposed project, including the identification of the transportation problem that is to be addressed and evaluation of alternatives to address the problem. In addition to the estimated cost and scope, the PID also includes the estimated schedule of the project. According to Caltrans, the above information is needed to decide if, how, and when to fund a particular project. State law requires a PID be completed before a project can be programmed for funding in the STIP. Caltrans and CTC administratively require a PID also be completed before a project can be programmed for funding in SHOPP. After a PID is completed and a project is programmed, then a more refined cost estimate is made based on specific project scopes and designs. Governor’s Proposal. The Governor’s budget proposes a total of 325 positions and $46 million ($42 million from SHA and $4 million from reimbursements) for Caltrans to develop PIDs in 2013–14. This reflects a proposed net increase of $9 million and 19 positions from the levels provided to the department in 2012–13. Specifically, the budget reflects the following major changes. $2.1 million reduction and 18 fewer positions from using a more streamlined approach for developing PIDs. $6.2 million increase to fund higher costs for existing PID staff than initially planned. $4.9 million increase and 35 additional positions to account for PID–related workload that Caltrans anticipates not completing on time in the current year. In addition, Caltrans indicates that it does not plan to request changes to the budget for the PID program in 2014–15. This is because the department assumes that it will need the same level of resources in 2014–15 as is being proposed for 2013–14. This approach is in contrast to Caltrans’ recent practice of updating the budget for the PID program each year. Thus, unless otherwise directed, the department does not intend to provide any justification for the program’s base budget or request any changes (either reductions or increases) as part of the 2014–15 budget process to reflect changes in workload. Proposal Raises Several Concerns. In reviewing the Governor’s proposal, we identified several concerns with certain aspects of the proposed budget changes. Specifically, our concerns are as follows. Proposal Understates Efficiencies From Streamlining PIDs. For the last several years, the Legislature has directed Caltrans to streamline its PID development process by eliminating requirements to perform certain studies and provide information that is not necessary on some projects. For example, Caltrans typically requires studies of the effects of potential project alternatives on traffic, noise, scenic resources, habitat and wildlife, community impacts, water quality, hazardous waste, cultural resources, air quality, and flooplains. However, many straightforward projects, such as repaving a highway, do not require these types of studies. For 2013–14, Caltrans indicates that it will switch a portion of its PID workload from lengthy PIDs to these more streamlined versions. While the Governor’s budget reflects savings of $2.1 million and 18 fewer positions as a result of these changes, we find that the actual savings could be much higher. Based on Caltrans’ estimated workload per PID and the number of streamlined documents it plans to produce in 2013–14, we find that the budget understates the estimated savings by $2.9 million and 21 positions. Department Unable to Manage Existing Resources. Despite the above savings from streamlining PIDs, the department is also requesting 35 additional positions for the PID program. According to Caltrans staff, the program has fallen behind on its work in the current year and must catch up in 2013–14. In addition, the department indicates that it currently lacks sufficient funding to pay the salaries and benefits for its 2012–13 authorized level of PID positions. As a result, Caltrans was not able to fill all the positions authorized for PID workload at the beginning of 2012–13. Although these positions have since been filled, the department indicates that the salary and benefit costs for the people hired exceeds its existing budget authority by $6.2 million. Since Caltrans’ staff indicates that this mismatch between funding and positions has been known for several years, it is unclear why the department chose to wait until after it was behind on its work before requesting a budgetary adjustment. Specifically, Caltrans was not able to complete 19 percent of the PIDs it was provided resources for in the 2012–13 budget. Split of Cost Increase Between State and Locals Not Accurate. As noted above, the budget requests an increase of $6.2 million from the SHA to bring funding for personnel services in line with the cost of existing positions. Some of these existing staff, however, will work on projects in 2013–14 that are funded with reimbursements from local agencies and not from the SHA. We estimate that of the $6.2 million requested increase, between $500,000 and $1 million should come from local reimbursements rather than from the SHA. Budget Adjustments in 2014–15 Likely Needed. Finally, we find that the department’s plan not to make or consider possible adjustments to the budget for the PID program in 2014–15 is problematic. This is because it is unclear whether the proposed level of resources for 2013–14 would be appropriate for the department’s PID workload in 2014–15. For example, Caltrans could need fewer resources in 2014–15 as the department continues to implement more streamlined PIDs. Finally, reviewing the budget for the PID program in 2014–15 will help the Legislature ensure that the department is able to effectively manage its program budget and workload. LAO Recommendations. In view of the above concerns, we recommend modifications to certain aspects for the Governor’s proposal for the PID program. First, we recommend that the Legislature reduce the Governor’s budget for the PID program by $2.9 million (SHA) and 21 positions, in order to more accurately account for total savings that could be achieved from using more streamlined PIDs. This would provide a staffing level roughly the same as in the current year. We also recommend that the Legislature require Caltrans to report at budget hearings on the amount of personnel services funding that will be reimbursed from local agencies and make the necessary budget adjustments to account for such funding. In addition, we recommend that the Legislature require Caltrans to report at budget hearings on why the mismatch between funding and positions was not corrected sooner and what steps the department will take to ensure that it does not fall behind on its PID workload in the future. The department’s failure to address this issue in a timely manner raises questions about Caltrans’ ability to manage resources for the PID program and to complete workload within established schedules and budgets. As such, we recommend that the Legislature require Caltrans to report as part of next year’s budget process on its efforts to meet current PID workload, and the resources it will require to complete planned work in 2014–15. Background. Active transportation involves the traveler being physically active, such as by biking or walking to a destination. Increasing the use of active transportation as a mode of travel can have several benefits to the state. For example, active transportation could help the state meet its sustainable communities goals that were established in Chapter 728, Statutes of 2008 (SB 375, Steinberg), commonly referred to as SB 375. Specifically, SB 375 requires regions within the state to develop integrated transportation and land use plans to reduce the level of greenhouse gases (GHGs) emitted by the transportation sector. Since active transportation modes are an important alternative to driving, communities are encouraged to consider such modes in meeting this requirement. Increasing active transportation can also lead to improved health outcomes as it involves people becoming more physically active. In addition, active transportation can help relieve traffic congestion by reducing the number of cars on the state’s roadways. Currently, the state maintains four different programs that support active transportation projects, among other things. One of the programs is funded by the federal government and the other three programs are funded by the state. Combined, these programs provide grants to roughly 400 projects statewide each year, totaling about $100 million to $200 million annually. This is primarily from federal funds, with the rest coming from state fuel taxes. On average, recipients receive a grant amount of $550,000. Thus, funded projects are typically small in scope and size, making it difficult for any one community to receive enough funding to build large projects or networks of projects. Transportation Alternatives Program (TAP). The TAP is a federally funded program administered by Caltrans. The program funds various projects such as bicycle lanes, pedestrian improvements, and recreational trails. State Safe Routes to School. The State Safe Routes to School program, which is administered by Caltrans, is intended to improve the safety of students who walk or bike to school. The program funds various projects, such as adding bicycle lanes, installing crosswalks, and providing crossing guard programs and safety education to students and parents. Environmental Enhancement Mitigation Program. The Environmental Enhancement Mitigation Program, which is administered by the state’s Natural Resources Agency, primarily funds roadway landscaping, roadside recreation, and environmental enhancements. The program also funds bicycle infrastructure projects, such as building bicycle paths. Bicycle Transportation Account. The Bicycle Transportation Account, which is administered by Caltrans, funds bicycle infrastructure projects. Such projects could include widening roads to add bicycle lanes and installing bicycle parking facilities. Governor’s Proposal. The Governor’s budget includes a proposal to consolidate the four transportation programs discussed above into a single active transportation program administered by Caltrans and totaling $138 million in 2013–14. Under the proposal, 50 percent of the funds would be awarded through a statewide competitive program, 40 percent of the funds would be allocated by formula to urban areas, and 10 percent would be allocated on a competitive basis to small urban and rural regions. The CTC would evaluate grant applications and select projects based on criteria described in proposed budget trailer legislation. Such criteria include the potential for (1) reducing pedestrian and bicyclist injuries and fatalities, (2) reducing traffic congestion, (3) improving air quality, (4) reducing GHG emissions, and (5) improving the mobility of non–motorized users. According to the proposal, the consolidated program would fund a wide variety of projects ranging from specific improvements for cyclists (such as bike racks on transit vehicles) to urban forestry projects. In addition, the budget proposes to reduce the number of staff at Caltrans who administer funds for active transportation projects from eight positions to five positions in 2013–14. Under the proposal, the number of positions would be further reduced to three positions in 2014–15. Allows Use of Funds for Non–Active Transportation. Although the Governor’s proposal is intended to focus existing program funds on active transportation projects, the proposed budget trailer legislation would continue to allow funds to be used for non–active transportation projects (such as urban forestry projects and roadside recreation). While such projects may have merit, they would not necessarily improve and facilitate active transportation. Given the relatively small amount of funding proposed in the Governor’s budget for the active transportation program, we find that the program could more effectively and efficiently achieve its active transportation goals by focusing exclusively on improving bicycle and pedestrian safety and increasing the use of active transportation modes by travelers in the state. Does Not Specify Size of Funded Grants. In addition, the Governor’s proposed trailer bill legislation does not specify the size of individual grants that communities could apply for, thus leaving that decision to the CTC. As previously discussed, the small grant amounts provided under the current program make it difficult for communities to pursue larger scale and more comprehensive active transportation projects, which tend to be more expensive. While achieving a geographic balance with the use of transportation funds is an important consideration, funding small unconnected projects is unlikely to result in significantly increasing the number of people choosing an active transportation mode. For example, studies have found that communities need to develop well–connected networks of bicycle and pedestrian infrastructure that lead to destinations, such as places of employment, schools, and shopping centers to encourage active transportation. Given that the Governor’s proposal does not specify specific grant amounts, it is unclear whether the grants will be sufficient to support the costs of such large–scale projects. Does Not Shift Staff Resources With Workload. While the proposal would shift some of the responsibilities for administering the active transportation program from Caltrans to the CTC, the proposed budget does not request any additional resources for CTC to carry out these increased responsibilities. LAO Recommendations. In view of the above concerns, we recommend modifying the Governor’s proposal in order to address these concerns. First, we recommend that the Legislature amend the proposed budget trailer legislation to require that the statewide competitive grant portion of the new program be used to fund larger community–wide projects. We also recommend that the program be authorized only to fund those projects that would (1) directly improve bicycle and pedestrian safety or (2) potentially increase the number of trips taken by bicycling or walking. In order to ensure that the new active transportation program is administered effectively, it may be necessary to provide the CTC with additional staff resources. Thus, we recommend the CTC report at spring budget hearings regarding the level of resources it will need to help administer the new active transportation program. To the extent that the CTC will need additional staff resources, the Legislature could shift a portion of the proposed reduction in positions at Caltrans to CTC. The California HSRA is responsible for planning and constructing an intercity high–speed train that would link the state’s major population centers. As shown in Figure 10, the Governor’s budget estimates total expenditures of $2.4 billion in 2012–13 and proposes total expenditures of $3.2 billion in 2013–14. Below, we provide an update on the progress that HSRA has made over the past year. We then review and make recommendations regarding the Governor’s major budget proposals for HSRA. Construction to Start in Central Valley in 2013. In November 2008, voters approved Proposition 1A, which allows the state to sell up to $9.95 billion in general obligation bonds to fund the development and construction of the high–speed rail system. (A timeline of the major events regarding the development and construction of the state’s high–speed rail system is shown in Figure 11.) The state subsequently received a total of $3.5 billion in federal grants for planning, engineering, and constructing up to 130 miles of dedicated and fully grade–separated high–speed rail line in the Central Valley. Of this total amount, $2.6 billion was made available in the 2009 federal American Recovery and Reinvestment Act (ARRA). The ARRA legislation, which was intended to provide macro–economic stimulus, requires that the $2.6 billion be spent prior to September 2017. In addition, $1.1 billion in unidentified funds and in–kind resources from local governments have been secured. The 2012–13 budget package appropriated $7.2 billion—$3.9 billion Proposition 1A bond funds and $3.3 billion federal funds—to HSRA. California voters approve $9.95 billion in bonds for high–speed rail in November 2008. High–Speed Rail Authority (HSRA) begins procurement process forconstruction in November 2011. HSRA board approves the 2012 business plan, which includes a new “blended” system strategy. 2012–13 budget package includes $6.1 billion for high–speed rail construction in the Central Valley and $1.1 billion to improve existing rail systems. Final environmental approval received for Merced–Fresno section. State Public Works Board allows the HSRA to begin acquiring right–of–way (ROW) between Madera and Fresno. HSRA will select design–builder for first construction package in summer 2013, and then begin construction of Central Valley segment. Final environmental approval expected for Fresno–Bakersfield section in fall 2013, and then procurement process will begin for remaining construction packages. ROW acquisition south of Fresno may begin. HSRA expects to select design–builders for remaining construction packages in spring 2014, and then start construction south of Fresno. Construction of Central Valley segment continues. HSRA expects to complete ROW acquisition in winter 2015. First construction package expected to be completed in spring 2016. All federal American Recovery and Reinvestment Act funds must be spent by September 2017. Final environmental approvals expected for all of the remaining sections by fall 2017. Central Valley segment expected to be completed. “Initial operating section”—which would run high–speed rail service between Merced and Palmdale—expected to be completed. “Bay–to–Basin” system—which would run between San Jose and San Fernando—expected to be completed. Phase 1 blended system—which would run between San Francisco and Los Angeles (or Anaheim)—expected to be completed. Construction of the high–speed rail segment in the Central Valley will begin in Madera, where it will connect with the existing Burlington Northern Santa Fe (BNSF) rail line. As shown in Figure 12, the project extends south through Fresno and towards Bakersfield. Ultimately, the length of this construction segment, as well as the location where the new rail line will reconnect with the BNSF, will be determined by the amount of funding available for construction. The HSRA received final approval of the environmental documentation for the segment between Merced and Fresno in September 2012. In January 2013, the HSRA received approval from the State Public Works Board (SPWB) to acquire the necessary land, or right–of–way (ROW), between Madera and Fresno. The HSRA currently expects to receive final approval of the environmental documentation for the segment between Fresno and Bakersfield this fall. At that time, the HSRA will be able to acquire the remaining ROW. The HSRA is using a design–build procurement process to complete the final engineering design and to construct the rail line. (Under design–build, the state contracts with one general contractor, or in this case a consortia of several firms, to design and build the project.) The project in the Central Valley is divided into four contiguous construction packages. A fifth construction package will lay track along the entire corridor after the other construction packages are completed. The procurement process for the Central Valley segment began with a request for qualifications from prospective design–builders in November 2011. Five bids for the design and construction of the first construction package—the rail line between Madera and downtown Fresno—were received in January 2013. The HSRA is evaluating those bids and expects to award the contract this summer. Design–builders for the remaining construction packages are expected to be selected in 2014. The HSRA anticipates that the project in the Central Valley will be completed in 2018. Local Assistance Provided for “Blended” System Projects. The 2012–13 budget package also appropriated $1.1 billion in Proposition 1A bond funds, to be spent over several years, for capital improvements on existing local rail systems that would advance high–speed rail in the San Francisco Bay Area and the Los Angeles Basin. The business plan approved by the HSRA board in April 2012 describes a blended system that attempts to integrate or blend the high–speed rail operations with existing passenger rail systems where feasible. In the San Francisco Bay Area, about $600 million in state bond funds are available for improvements to the Caltrain commuter rail line, which provides commuter rail service between San Francisco and San Jose. In the Los Angeles Basin, about $500 million in state bond funds are available for capital improvements to existing passenger rail systems or facilities. The local assistance funds must be matched with at least equal contributions of funds or in–kind resources. Remaining Funding Still Not Secured. The 2012 business plan identifies a phased approach to constructing and implementing the high–speed rail system, in part, to address the lack of funding to complete the entire system. 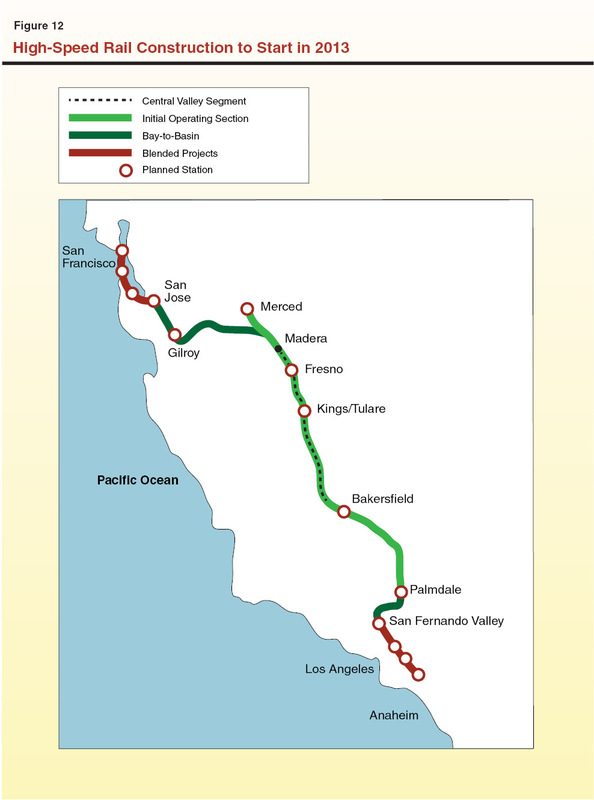 The entire Phase 1 blended system (connecting the San Francisco Bay Area to the Los Angeles Basin) is estimated to cost $68.4 billion. However, only $14.6 billion in funding has been secured—$9.95 billion in Proposition 1A bond funds, $3.5 billion in one–time federal funds, and $1.1 billion in unidentified funds and in–kind resources from local governments. After the initial construction project is completed, approximately $4.5 billion in Proposition 1A bond funds will remain. However, no additional funding for the remaining $53.8 billion has been secured. $1.6 million in Proposition 1A funds to fund 20 new permanent positions at HSRA to provide information technology (IT), contract management, and transportation planning functions. $4.1 million in Proposition 1A funds to contract for program management oversight, which provides engineering consulting services to HSRA executive management. This is a reduction of $900,000 compared to the current–year level of funding. The budget also proposes budget bill language that would allow HSRA to administratively establish new permanent oversight positions when it determines that it can take on some or all of the responsibilities of the private contractor. $3.8 million in Proposition 1A funds to contract for financial services consulting, which is an increase of about $1.3 million from the current–year level of funding. $500,000 in Proposition 1A funds for public outreach services. The Governor’s budget also proposes for 2012–13 and 2013–14 to spend a greater share of federal funds at the beginning of project construction, followed by a proportionally greater share of Proposition 1A bond funds as the project nears completion. According to the HSRA, this will reduce the risk of not spending the ARRA funds before the required deadline of September 2017. The federal government and the HSRA amended their cooperative funding agreement in December 2012 to allow for this arrangement. Funding in Other Departments for High–Speed Rail Workload. In addition to the above funding requests for HSRA, the Governor’s budget also proposes increased positions and funding at the California Public Utilities Commission (CPUC) and the Department of General Services (DGS) to handle workload related to high–speed rail. Specifically, the budget provides (1) $300,000 (Public Transportation Account) for CPUC to support three permanent positions to develop new safety standards for high–speed rail and (2) $684,000 (reimbursement authority) for the Real Estate Services Division at DGS to support five permanent positions to assist the SPWB and the HSRA with various ROW acquisition activities. In October 2012, HSRA provided a staff management report to the Legislature, as required by Chapter 152, Statutes of 2012 (SB 1029, Committee on Budget and Fiscal Review). In this report, HSRA indicated that most of its managerial vacancies had been filled, as well as provided strategic guidelines for its continued transformation from a planning organization to an organization responsible for delivering the largest capital outlay project in the state. The HSRA also reconfirmed its commitment to maintaining a “lean” organizational structure in which the engineering design and construction is performed by external consultants. Such an approach can provide greater flexibility, reduce risk, and enable HSRA to draw on engineering experience gained from building high–speed rail systems around the world. However, relying heavily on external consultants requires effective oversight by state staff. Accordingly, the HSRA also reported that it will need to add roughly 60 permanent state staff over the next two years to manage these contracts and oversee the increasingly large number of external consultants. Specifically, the above report stated that HSRA will request an additional 30 engineering positions, 13 planning positions, and about 20 finance and administrative positions to help integrate high–speed rail with local transportation systems, manage the various contracts, and provide oversight of the design–builders. The Governor’s budget proposes 20 additional positions including 2 positions for transportation planning and 18 positions for finance and administration. These positions are consistent with the HSRA’s approach described above, but the budget does not propose any additional engineering positions. According to HSRA and the Department of Finance, the authority is still evaluating its engineering staffing needs. This is a concern given that construction is set to begin this summer. The HSRA has relied on external engineering consultants funded in the program management oversight contract to increase oversight capacity and provide technical engineering expertise on an as–needed basis. While the Governor’s budget requests $4.1 million in funding for this contract, the administration also proposes to move some or all of this function in–house. While this could be a more cost–effective approach to program management oversight, the proposal has not been sufficiently developed and was not considered in the staff management plan. In addition, the budget proposal is vague about the number and types of state staff that would provide the oversight role. It is also unclear if the HSRA would continue to have access to the kind of as–needed independent technical engineering expertise that can be provided under the existing contract. Below, we make a series of recommendations regarding each of the Governor’s staffing proposals to help ensure effective oversight of the high–speed rail project. Approve Request for Additional State Staff. The additional 20 state staff proposed are justified on a workload basis. As the HSRA approaches the start of construction, and increases the number of contract management and oversight staff, its administrative needs will increase as well. As the organization grows, it is also better to move some ongoing business support functions, such as IT in–house. Accordingly, we recommend approval of this request. Continue Program Management Oversight and Deny Authority to Administratively Establish Oversight Positions. We recommend the Legislature approve the request for contract funding because it is necessary to continue this critical oversight function. However, we have concerns that the proposed budget bill language that would authorize HSRA to transfer funds appropriated for the program management and oversight contract to state administration to fund these additional positions without appropriate legislative oversight. As we previously discussed, the HSRA has not, to our knowledge, completed an analysis of the number of staff it would need on a permanent basis and how much ongoing support for external program management oversight, if any, it would continue to need. Having a clear and detailed plan is needed in order to ensure that the most cost–effective approach is taken. We also find that such changes in staffing authorization should be approved by the Legislature as part the budget process. Accordingly, we recommend the Legislature reject the proposed budget bill language because it would not allow for appropriate legislative oversight of the establishment of new permanent state positions. Reduce Funding for Financial Consulting Services. The financial services consultant provides some specialized and intermittent services that would be difficult for state staff to perform, such as evaluating the qualifications of potential design–builders and providing technical financial analysis of various business models and procurement approaches. Based on our review of the proposed scope of work that was submitted to justify the increased funding request, we find that some of the identified tasks (such as revising the existing financial plans and writing several chapters of the next iteration of the business plan) would be more appropriate for, and less costly if performed by, existing state staff. We recommend the Legislature reduce funding for financial services consulting by $1.25 million in Proposition 1A bond funds—from $3.75 million to $2.5 million (the amount of the 2012–13 appropriation). Hold Project Oversight Hearings. The Legislature has enacted legislation to help ensure effective oversight of the project through various reporting requirements, an independent expert panel, and external audits. As the project proceeds, we recommend that the Legislature use budget hearings and policy hearings to continue to evaluate the effectiveness and adequacy of the external oversight that currently exists and make adjustments as necessary. Specifically, the local assistance program will require state oversight to ensure that the funds are only being spent on eligible blended system projects. In addition, we recommend that the Legislature use budget hearings to evaluate whether the administration has requested a sufficient number of state staff to provide rigorous and effective oversight of the construction process which is expected to begin in 2013–14. Reject Proposed Funding for CPUC and Modify Proposed Funding for DGS. Our analysis finds that the requested funding for CPUC to develop high–speed rail regulations is premature given the reality that California’s high–speed train service will not be in operation before 2021 at the earliest. Accordingly, we recommend that the Legislature reject this request. Regarding the budget request for additional staff in DGS’s Real Estate Services Division, we would note that this workload is temporary. As previously discussed, the HSRA began the process of acquiring ROW in the current year and expects to complete this activity in 2015–16. Therefore, we recommend that the Legislature modify this request to provide DGS the additional positions and reimbursement authority on a two–year limited–term basis, rather than on a permanent basis as is being proposed by the Governor. The primary mission of the CHP is to ensure safety and enforce traffic laws on state highways and county roads in unincorporated areas. The department also promotes traffic safety by inspecting commercial vehicles, as well as inspecting and certifying school buses, ambulances, and other specialized vehicles. The CHP carries out a variety of other mandated tasks related to law enforcement, including investigating vehicular theft and providing backup to local law enforcement in criminal matters. Background. The CHP operates 103 area offices across the state, which usually include a main office building for CHP staff, CHP vehicle parking and service areas, and a dispatch center. According to DGS, about 80 of the CHP’s area offices are seismically deficient and require replacement. In addition, the CHP indicates that many offices are experiencing workspace shortages. For example, many existing facilities were not designed to accommodate some of the additional program responsibilities that the department has undertaken over the years (such as commercial vehicle inspection). Area office replacements can be procured in one of a few ways. The most common are “build–to–suit” leases and direct capital outlay. With the build–to–suit procurement method, CHP contracts with a private developer to construct a facility and agrees to lease the facility from the developer for a predetermined number of years. At specified times during the built–to–suit lease, CHP has the option to purchase the facility from the developer. With the direct capital outlay procurement method, DGS uses funds from the MVA to both purchase the property and contract with a private developer to design and build the CHP facility. Under direct capital outlay, the state owns the facility and does not have ongoing lease payments. Last fall, the Director of DGS notified the Joint Legislative Budget Committee (JLBC) of his intent to execute three separate build–to–suit lease agreements on behalf of CHP to replace existing area offices. Although the JLBC did not request that the administration delay or cancel these three projects, the committee did raise several issues, including the (1) absence of an updated CHP facilities plan that outlines its facility needs and priorities and (2) lack of an assessment of the relative benefits of financing projects with the build–to–suit process or capital outlay. Governor’s Proposal. The Governor’s budget for 2013–14 provides $1.5 million from the MVA to CHP for advanced planning to replace five area offices that will be financed with the direct capital outlay procurement method. However, the budget does not identify which specific area offices will be replaced. In addition, the proposed budget includes provisional language to allow the SPWB to augment the CHP’s budget item by up to $10 million (MVA), in order for CHP to acquire property for the replacement offices if the purchase cannot wait until enactment of the 2014–15 budget. Under the proposed language, the SPWB would be required to provide notification to the Legislature at least 20 days prior to making an augmentation. CHP’s Long–Term Facilities Replacement Plan Remains Unclear. At this time, the Legislature still does not have an updated CHP facilities plan that outlines its facility needs and priorities. Such a plan would show the total number of replacement facilities CHP will request over the next five years and how those proposals would affect the MVA. According to the administration, this type of analysis will be included in its updated 2013 Five–Year State Infrastructure Plan, which is expected to be released this spring. The absence of such a plan makes it difficult at this time to assess how the Governor’s budget proposal fits within CHP’s long–term plan as well as the state’s plans for funding other infrastructure needs. Moreover, as mentioned above, the Governor’s budget does not identify which five area offices will be replaced and whether those offices are in the worst condition and most in need of replacement. No Analysis on Procurement to Justify Method. At this time, it is also unclear why the administration proposed last fall to replace three area offices with build–to–suit leases and is now proposing to use a capital outlay method to replace five offices. Specifically, the administration has not been able to explain what criteria it uses to select between capital outlay and build–to–suit. As previously indicated, the JLBC expressed that such an assessment is essential to ensure that the most cost–effective method is chosen when building new CHP facilities. Proposed Budget Bill Language Circumvents Legislative Oversight. Finally, we find that the proposed budget bill language would limit the type of legislative oversight that is typically provided in the traditional facility replacement process. This is because the proposed language would not allow the Legislature to adequately review and approve the specific offices to be replaced, as well as the proposed scope and estimated cost of each office, before the actual property is purchased. This is problematic in that making changes to the scope of the project after the property is purchased becomes more challenging. LAO Recommendation. In view of the above concerns, we withhold recommendation on the Governor’s proposal. The CHP should first identify which five area offices will be replaced and why those facilities are most in need of replacement, as well as explain why it proposed last fall to replace offices with build–to–suit leases and is now proposing to use a capital outlay method for these five offices. This information, along with the state’s 2013 Five–Year Infrastructure Plan, will assist the Legislature in ensuring that the highest–priority projects and the most cost–effective method for delivering these projects are being proposed.